Recipient of highly favorable reviews and national awards. This fascinating story is the detailed account of the voyages of USS LST 561 from October 1951 until July 1954. Transporting thousands of prisoners of war in Korea, wending a tortuous path through Arctic pack ice, and a pre-dawn beaching on the black sands of Iwo Jima are but three of the adventures described in this 208-page book that contains over 300 of the author’s color photographs. The book is written in a style that makes understandable and enjoyable reading for everyone. The book is dedicated to the memory of the men who perished in one of the ship’s boats on 3 March 1952. The disappearance of "Swanee Leader" which was the radio call sign of the craft, resulted in one of the largest number of lives lost from a U. S. Navy ship during the Korean War. Come in, Swanee Leader, presents a minute-by-minute description of what occurred on that ill-fated day. The account of this tragedy has never been published before. An entire chapter is devoted to describing life and living conditions aboard a Landing Ship Tank. These ships were prominent in World War II and the Korean War, however, there are no LSTs in commission in the U. S. Navy today. 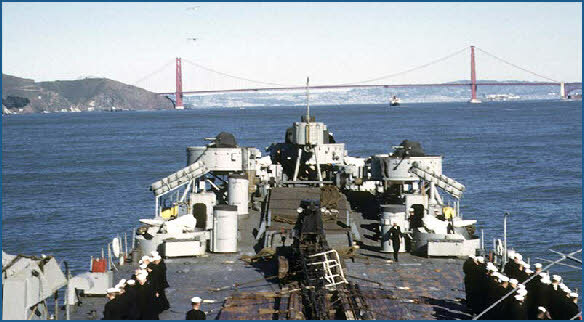 The title picture was photographed on 9 February, 1953 as the ship was standing in to the Golden Gate and San Francisco Bay. Buy the Book "Come In, Swanee Leader"